According to the US EPA, every gallon of gasoline your vehicle burns puts 20 pounds of carbon dioxide into the atmosphere, and contributes to global warming. If you drive a vehicle that uses gasoline, or any fossil fuel, then you can play a role in reducing greenhouse gas emissions that lead to climate change. You can reduce (or offset) the effect your driving has on the environment by supporting projects that reduce greenhouse gases anywhere in the world, and effectively make your vehicle “Greenhouse Gas Neutral”. Cars and trucks greatly contribute to global warming by burning gas and diesel fuels, accounting for over a quarter of all US greenhouse gas emissions (GHGs). In the U.S. economy, transportation is second only to electricity generation in terms of the volume and rate of growth of GHG emissions. In terms of carbon dioxide, which accounts for 95 percent of transportation’s GHG emissions, transportation is the largest and fastest growing end-use sector. Today, the U.S. transportation sector accounts for one-third of all U.S. end-use sector CO2 emissions, and is projected to rise to 36 percent by 2020. DrivingGreen offers you the ability to affordably offset your own vehicular greenhouse gas emissions. In doing so you help the environment, battle global warming, and can confidently tell your friends how easy it is! Methane is a greenhouse gas that is 21 times more potent in global warming than carbon dioxide; nitrous oxide is 310 times more potent than carbon dioxide. In other words, reducing 1 tonne of methane has the same positive effect as reducing 21 tonnes of carbon dioxide. Reducing 1 tonne of nitrous oxide has the same positive effect as reducing 310 tonnes of carbon dioxide. These projects also promote cleaner air and water. How much greenhouse gas will your vehicle emit into the atmosphere this year? 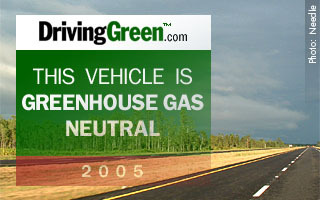 Use the simple DrivingGreen GHG calculator on our site at www.drivinggreen.com/emissionscalc.asp to find out. Your purchase will support projects that reduce methane (CH4) and nitrous oxide (N2O) emissions in agriculture. Methane and nitrous oxide are two very powerful greenhouse gases, more powerful than carbon dioxide (CO2) in terms of global warming. When you offset your emissions you receive a T-shirt, license plate holder and a car decal to display your commitment to the environment. But most importantly, you receive a serialized certificate. The serial number can be used to trace the offsets to the project that reduced the greenhouse gas emissions.